HIGH up in the mountains which overlook Searles lake, at the head of a tortuous, rocky trail, lie the ruins of the old homestead of John Wemple Searles. In the march of time over 75 years have passed since that home was built, but in the still of the desert the deep canyon seems to echo the chant of Chinese coolies as they picked and shoveled away at the rocky hillside to build terraces and walls and develop a water supply. Time and cloudbursts have almost obliterated the trail, and the buildings have crumbled away, but the mammoth fig trees and grape vines, still flourishing and bearing fruit, are living memorials to the courage and faith of one of the most colorful characters of early desert history. John Searles was among those intrepid pioneers who endured hardship and privation to reach the California gold fields by way of the wagon train in 1849. Descending from ancestors who won renown with the American army in the Revolutionary war, the courage and fearlessness which he had inherited were his only possessions when he joined his brother Dennis at Indian creek, Shasta county, California. The two brothers cast about for a few years in farming and mining but eventually disposed of their holdings, and in 1862 acquired and began operating mining claims in the Slate range, just east of the present Searles lake in central California. Their camp looked out on a vast dry lake of what was thought at that time to be salt and carbonate of soda. Later this acreage was increased to over 2,000. Then he made another trip to San Francisco with samples. When he was told again that his crystals contain no borax he became suspicious. When he left San Francisco for Los Angeles he was followed, but while in Los Angeles he formed a partnership with Charles Grassard, Eben M. Skillings and his brother Dennis. While the other three gathered simple equipment for starting operations, Searles went in an opposite direction, camping and prospecting, still being followed. When he was able finally to elude his followers he joined his partners at the claims. When word reached the outside world that there was borax in Searles lake, hordes of men came to stake out claims. Claim jumping and murder knew no law on that frontier but in time most of the claimants starved out and the claims were abandoned. One or two small organizations attempted to produce the borax as a paying industry but for one reason or another faded out of the picture. With crude equipment Searles' little band collected borax in cowhide baskets The highly chemicalized brine from beneath the dry surface of Searles lake has created a town of 2500 people at Trona. and carried it to a large boiling pan where it was boiled for 36 hours. The solution was then run into vats so that the crystals could form on the sides. After drying it was put into 70-pound bags, loaded into 20-mule-team wagons and hauled to San Pedro, California, where it was transported by water to San Francisco. Thus the borax industry on the now famous Searles lake was born. Those wagons, built and operated for Searles by Oso Viejo, who, at the time of this writing is still living in Los Angeles, were the first 20-mule-team borax wagons ever put in operation. It was one of the Searles wagons that Salty Bill Parkinson, Searles' foreman, later drove across country for exhibition at the St. Louis exposition in 1904. On January 1, 1873, Searles married Mary Covington in Los Angeles, California. On February 27, 1874, a son, Dennis, was born to them. But those were difficult years for the city-bred girl. Never inured to the rigors of desert pioneering, her mind wandered in the maze of primitive hardships and lost its way. Though deprived of her help and companionship he continued, with the aid of a faithful old Chinese cook, to keep his small son with him and carry on his enterprises. In the operation of his borax works Searles had accumulated considerable real and personal property�land, buildings, wagons, mules, horses and other equipment. On one occasion he had gone with the mule team shipment to San Pedro, leaving Dennis, then four years old, in the care of the Chinese cook. A few days after the wagon train had left camp there suddenly appeared in the distance, like a plague of locusts, a band of hostile Indians. Sensing the danger the old Chinaman quickly gathered some food and fled with Dennis into a nearby canyon in the mountains. The Indians closed in on the camp, burned everything that would burn, and drove the stock over the Slate range into the Panamint valley. Sand storms in all their deadly fury are as nothing compared with the anger of One day Searles, confiding in no one, gathered samples of crystals from the bed of the lake and took them to San Francisco for analysis. At first he was told they contained borax. But after more trips to San Francisco and more analyses had been made, he was told that they contained not a single trace of borax. Disappointed, he returned to the desert where he devoted the next few years to working his mine and developing his homestead in the mountains. One day in 1873 a man drifted into the Searles mining camp with some samples from a new borax discovery in Nevada. Realizing that they were the same type of crystals as the samples he had previously taken to San Francisco, Searles' interest in his own discovery was aroused once more. With a pack outfit he went to the south end of the lake and located 640 acres. John Searles when he returned and beheld the ruins of all that he possessed. As soon as the Chinaman and Dennis reappeared he assembled the team, took the same drivers, and started back for San Pedro, stopping enroute to leave his two passengers in friendly hands in San Bernardino. At San Pedro they bought mules, old army saddles and repeating rifles, hired a small band of longshoremen from the docks, and returned to the desert to track down the Indians. Searles caught up with them in the foothills of the Panamint mountains where a bloody battle ensued. The Indians were fighting with bows and arrows, and, as one of the survivors told later, they did not fear the white men, thinking that the arrows would mow them down while rifles were being reloaded. Many Indians were killed and wounded and the remainder fled in panic, leaving the livestock behind. Searles and his men drove the stock back into Searles lake basin where he began the heart-breaking task of rebuilding the borax works. In later years the faithful Chinese servant enjoyed an annuity which had been established by Searles. He died in San Francisco's Chinatown 10 years after Searles had passed on to his own reward. The son Dennis later attended Stanford university where he graduated in its first class with Herbert Hoover. He died in San Francisco November 25, 1916. In the rebuilding of the borax plant a corporation was formed under the name of the San Bernardino Borax Mining company. About 60 men were employed. The borax was still hauled out by 20-muleteam wagons to Mojave, the then nearest railway station, where it was shipped by rail to San Francisco. With each load worth $4,000, and a load going out every four days, the business produced a tremendous revenue, but rival concerns paid Searles and his associates such a handsome sum of money to discontinue operation that they closed down their plant in 1895. At the time of the operation of Searles' plant geologists considered the surface deposit to be the largest supply of natural borax in the world. None of them, not even John Searles himself, dreamed that under the hard white surface of the lake was a subterranean brine and a vast stratum of crystals containing thousands of times more borax than was exposed on the surface, as well as many other salts and chemicals which were later to take their place in the world of science, industry, agriculture and national defense. When it was discovered that the underground lake also carried a vast potash content, the President of the United States, by a proclamation, withdrew Searles lake into a potash reserve. Congress shortly thereafter passed a leasing bill authorizing the department of the interior to lease the deposits of potash and other minerals in the lake, preventing private parties thenceforth from procuring it outright. This bill, however, did not disturb those claims which already had been patented, including the holdings of the San Bernardino Borax Mining company as well as those of the California Trona company, a subsidiary of Goldfields, Ltd. In 1908 the California Trona company undertook to manufacture chemicals from the brine, but, for various reasons, found the going too tough and went into the hands of a receiver. The company lay practically dormant until 1913, when it again made the same attempt under the name American Trona corporation. Between 1913 and 1916 various experimental processes were developed, tests were made, plants were built at enormous expense and promptly abandoned. History does not record whether those trying years proved to be a death struggle for the processes previously used or labor pains of the new Trona which was about to be born, but finally, in 1916, a plant to produce potash and borax by what was known as the Grimwood process was completed and placed in operation. Ten wells, about 85 feet deep, were drilled through the salt crust and into the brine. A pumping plant was installed and a pipeline constructed to carry the liquid to the plant where the chemicals were extracted by means of evaporation. This plant was the real beginning of the present Trona. Production of salts from the brine by the American Trona company, and its successor, the American Potash and Chemical corporation, has been continuous since that time. The variety of the uses for Trona products seems to be as unlimited as the universe. The coarse grade of potash is used chiefly in fertilizers. The finer grade is used in the manufacture of soaps, textiles, matches, medicines, dyes, glass, photographic preparations, and many other things. One grade of borax finds its way into heat-resisting glasses, ordinary bottle glass, and vitreous or porcelain enamels, glazes for ceramic ware, leather, paper, adhesives and textiles. It is used as a solvent for casein, as a flux in the brazing and welding of metals, to retard the decay of citrus fruits, and to prevent the growth of certain fungi which cause sap stain in numerous types of lumber. Boric acid (technical) is used in the manufacture of vitreous enamels, heatresisting glass and glazes for ceramic ware. It is also used in electro-plating and the manufacture of electrolytic condensers. More highly refined boric acid goes into various pharmaceuticals and cosmetics. Soda ash is probably the most versatile of all the products obtained from the Searles lake brine. It becomes baking soda, drugs, dye-stuffs, caustic soda, and other salts containing sodium as the base. It softens water, helps in the refining of lubricating oils, is an ingredient in wood preservatives and is a useful element in the manufacture of paper. Salt cake (sodium sulphate) is largely used in the manufacture of kraft paper, plate and window glass, dyes, chemicals, tanning, cattle dopes and pharmaceutical products. The youngest brain-children of the research department are the recovery of lithium from the process foams and slimes which formerly were wasted and the recovery of bromine and alkali bromides from the potash. Heretofore lithium has been obtained by mine production of minerals. As prepared at Trona it constitutes the highest grade lithium ore yet known. In addition to a great many medicinal uses lithium chloride is used in air-conditioning units for de-humidifying, in metallurgy for copper refining, in the red fire of fireworks, and for many chemical experiments. Bromine and the bromides are largely used in modern industrial arts. It is a vital constituent of Ethyl gasoline as well as a fumigant for preventing weevils and damage to stored supplies of grain. The bromides are used also in the photographic industry. In a national emergency the photographer and his supplies as well as the Ethyl gasoline used in aeroplanes become of utmost importance. And the end is not yet! The axiom in the old riddle "the more you take, the more you leave" must have been said of the brine in Searles lake, for, in spite of the enormous amount pumped out each day, scientists claim that it constantly is being replaced and that there is no indication that the supply will be diminished for at least 100 years. And so, judging the future by the past, who can say what additional wonders for the benefit of all mankind are still lurking in that brine? The village of Trona resembles, to some extent, an army post. Where once there was a pitiful little handful of rude cabins on the edge of the salt beds there are now hundreds of modern comfortable homes on well-laid-out streets. There is a fullyequipped grade and high school, a public library, a modern up-to-the-minute hospital with two doctors, a corps of nurses and a dentist; a moving picture theater, an 18- hole golf course, and a completelyequipped tfapshooting ground. It also boasts an airport with hangars for a number of privately owned planes, as well as one of the finest open-air swimming pools in the West. A large and commodious retail store carries food, dry goods and drugs. 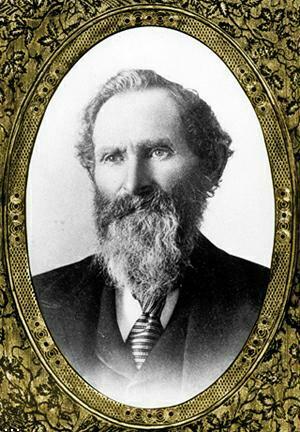 In the early mining days of John Searles it was necessary for him to drive his mule team over 100 miles to Tehachapi for his supplies and feed for his stock. Later he ran a small store of his own for the benefit of the employes in his borax works. The ruins of that little store building are still standing on the shore of the lake. In contrast to the 20-mule-team wagons which groaned and creaked their way across the desert in the early days of John Searles, the American Potash and Chemical corporation now owns and operates its own railroad between Trona and Searles station, a distance of 31 miles, where it connects with the Southern Pacific railway. Two huge engines, piloting an average of 35 cars, now puff out of Trona every day starting about 1,300 tons of products on their way to every corner of the globe. There are now 19 wells operating on the lake and an average of 2,700,000 gallons of brine flow through pipelines into the plant every 24 hours. From this brine approximately 1,260 tons of chemicals are extracted. To carry on this herculean chore, with loading and shipping, requires about 1,250 employes, who, with their families, constitute the entire population of Trona, numbering about 2,500. With Trona products taking such an important place in the scientific and industrial world, it is not surprising that the interesting little city has gathered unto her bosom a most unusual class of people. It boasts some of the finest chemical and engineering brains in the country. Houses, administration buildings, store buildings and dormitories for single men and women are all air-cooled�almost sinfully comfortable in the hottest summer weather. It's a far cry back to those pioneering days when there was no relief from the dancing, baking heat waves of the lake basin. John Wemple Searles, son of George and Helen Wemple Searles, was born at Tribes Hill, Montgomery county, New York, on November 16, 1828. Though the glittering, shimmering borax crystals in the bed of the lake which now bears his name were not the yellow gold which he expected to find at the end of the covered wagon trail, they made him a rich man and left a legacy of benefits and blessings to be enjoyed by the whole world for generations to come. History records that in his early pioneering days, while on a deer-hunting expedition into the mountains of Kern county, Searles had a gruelling, breath-taking fight with a huge grizzly bear which left his shoulder and one side of his face permanently mangled. Companions on the hunt managed to get him to Los Angeles where surgeons miraculously saved his life. Grim reminders of the incident today are a bottle containing 21 pieces of broken bone and teeth and an old Spencer rifle with many bear-teeth dents in it. Perhaps only the kind of pluck and courage which saw him through that encounter could have fought off claim jumpers and marauding Indians in his early borax days and establish for posterity one of the most important industries in America today. John Searles died on October 7, 1897, and his body lies in the purple shadows of the little cemetery at St. Helena, California. But to watch the sun sink behind the hills at Trona and the short twilight fade into night, with the silhouette of the huge industrial giant outlined in black against the desert sky�then suddenly a million electric lights rivaling the long jagged points of the stars�one feels that his spirit has come back that the desert may claim its own; that here indeed death has been swallowed up in victory.